Lymphocyte Activation Gene-3 (LAG-3) is a transmembrane protein that binds MHC class II, enhances regulatory T cell activity, and negatively regulates cellular proliferation, activation, and homeostasis of T cells. Programmed Death 1 (PD-1) also negatively regulates T cell function. LAG-3 and PD-1 are both transiently expressed on CD8 T cells that have been stimulated during acute activation. However, both LAG-3 and PD-1 remain on CD8 T cells at high levels after stimulation within tolerizing environments. Our previous data demonstrated that blockade of either LAG-3 or PD-1 using mAb therapy in combination with vaccination restores the function of tolerized Ag-specific CD8 T cells in models of self and tumor tolerance. It is unclear whether tolerized CD8 T cells coexpress PD-1 and LAG-3 or whether PD-1 and LAG-3 mark functionally distinct populations of CD8 T cells. In this study, we describe three populations of CD8 T cells activated under tolerizing conditions based on LAG-3 and PD-1 staining, each with distinct phenotypic and functional characteristics. From a mechanistic perspective, both Ag concentration and proinflammatory signals control the expression of LAG-3 and PD-1 phenotypes on CD8 T cells under activating and tolerizing conditions. These results imply that signaling through the PD-1 and LAG-3 pathways have distinct functional consequences to CD8 T cells under tolerizing conditions and manipulation of both Ag and cytokine signaling can influence CD8 tolerance through LAG-3 and PD-1. Lymphocyte Activation Gene-3 (LAG-3)3 is a CD4 homologue that binds to MHC class II (1). Many cells of the hematopoetic lineage, such as B, NK, γδ T cells, and activated and regulatory CD4 and CD8 T cells, as well as tumor infiltrating lymphocytes, express LAG-3 (2, 3). On T cells, expression of LAG-3 serves to negatively regulate both activation and homeostasis (4, 5). Previously, we showed that LAG-3 is relatively over-expressed on transgenic CD4 T cells rendered anergic in vivo by encounter with cognate self-Ag (3). In this system, tolerized CD4 T cells displayed regulatory function both in vitro and in vivo, and in vitro regulatory activity was blocked with a LAG-3 specific mAb. Naive CD8 T cells express low levels of LAG-3, however expression dramatically increases in response to Ag stimulation (6). We have recently shown a direct role for LAG-3 on maintaining the tolerogenic state of CD8 T cells in vivo. By treating tolerized mice with a LAG-3 blocking Ab, accumulation and cytolytic function of tolerized CD8 T cells was enhanced leading to a partial reduction in tumor grade in an autochthonous tumor model (7). These data suggest that LAG-3 plays an important functional role on CD8 T cells by maintaining the tolerogenic state, and that inhibition of LAG-3 through Ab blockade can reverse this state and partially restore effector function. Like LAG-3, Programmed Death 1 (PD-1), is transiently up-regulated on activated T cells and negatively regulates their function (8). PD-1 expression is sustained at high levels on CD8 T cells that have become chronically activated and nonfunctional after viral infection (9, 10). Indeed, HIV-specific CD8 T cell exhaustion could be reversed using Ab-mediated blockade of the PD-1:B7-H1 pathway (11). Because either LAG-3 or PD-1 blockade can partially restore the function of tolerized CD8 T cells, we chose to test whether an individual CD8 T cell coexpresses both inhibitory proteins or whether subsets of CD8 T cells express individual inhibitory proteins during chronic Ag stimulation. B10.d2 (Thy1.2+, H-2d) mice were obtained from The Jackson Laboratory. C3-HAhigh and C3-HAlow (Thy1.2+, hemagglutinin (HA)-expression on multiple tissues) mice on the B10.d2 background were described previously (12). Clone 4 TCR transgenic (Thy1.1+, Kd; HA-specific) mice were provided by L. Sherman (Scripps Institute, La Jolla). LAG-3−/− mice were crossed with B10.d2 Clone 4 mice for at least 10 generations. Mouse care and experimental procedures were performed under pathogen-free conditions in accordance with established institutional protocols from Institutional Animal Care and Use Committees of Johns Hopkins University. Recombinant Vaccinia virus expressing wild-type (WT) HA protein was used in vaccination strategies and was created as described previously (12). For adoptive transfer experiments, Clone 4 mice were sacrificed via CO2 asphyxiation. Spleens and lymph nodes were collected, homogenized, and RBC were lysed. CD8 T cells were purified using Miltenyi magnetically labeled beads according to the manufacturer’s protocol. For some experiments, purified cells were labeled for 8 min with CFSE (Invitrogen) by adding 0.5 ml of 5 mM stock per 1 ml cells. After labeling, cells were washed twice and resuspended with HBSS for i.v. injections. Typically, 106 cells were injected per mouse in 0.2 ml by tail vein injection. On day 7 after adoptive transfer, recipient mice were sacrificed via CO2 asphyxiation. Axillary lymph nodes were homogenized, dissociated, and washed. For FACS analysis, cells from lymph nodes were stained using αThy1.1 Ab and αPD-1 (J43) Ab (BD Pharmingen). Cells were analyzed using a FACSCalibur (BD Biosciences). Intracellular staining for LAG-3, TNF-α, and IFN-γ was performed as previously described (13). In brief, 106 lymphocytes were incubated with synthetic immunodominant hemagglutinin class I peptide (IYSTVASSL) and 5 μg/ml monensin for 5 h in vitro. CD107 staining was performed as described (14). Equal volumes of IFA (Sigma-Aldrich) and HA class I peptide (IYSTVASSL) diluted in PBS were gently vortexed followed by brief sonication pulses on ice. One hundred milliliters of emulsion was injected into the flank of each mouse close to the superficial inguinal lymph node, which served as the draining lymph node for these experiments. Adoptive transfer of 106 Clone 4 CD8 T cells was done on the same day as emulsion injection. Seven days after transfer, lymph nodes were harvested for analysis of LAG-3, PD-1, and IFN-γ as described above. Effector CD8 T cells (1–5 × 106 per mouse) were adoptively transferred into C3-HAhigh mice. After 3 days, organs were harvested, RBC lysed, and single cell suspensions were incubated for 2 h on tissue culture plates in RPMI 1640 containing 2% FCS. Nonadherent lymphocytes were then stained for CD8-PE, PD-1-FITC, and Thy1.1-allophycocyanin. Cells were sorted into CD8+Thy1.1+PD-1int or CD8+Thy1.1+PD-1high groups. Sorted cells were cultured in vitro for 3 days in six-well plates coated with anti-CD3 and anti-CD28. For a positive control, naive Clone 4 splenocytes were stimulated with anti-CD3 for 3 days followed by CD8 purification using positive selection (Miltenyi Biotec). Effector cells were mixed at indicated ratio with peptide-pulsed 51Cr-labeled target cells for 4 h in V-bottom 96-well plates. The B cell lymphoma cell line A20 (MHC class II+, PD-L1+) was used as target cells. Supernatant was collected and counted in a Wallac Microbeta counter to assess chromium release. % specific lysis = 100 × ((experimental lysis − spontaneous lysis) / (total lysis − spontaneous lysis)). C3-HAhigh mice were adoptively transferred with Clone 4 CD8 cells as above. Appropriate mice received daily doses of either 10 μg LPS (Sigma-Aldrich) or 250 ng poly(IC) (Invivogen) i.p. Five days after transfer, mice were sacrificed and lymph nodes removed to assess Clone 4 CD8% and expression of LAG-3 and PD-1. Samples were acquired by performing in vivo TLR stimulation as above, followed by sorting Thy1.1+CD8+ Clone 4 CD8 cells. Total RNA was isolated using TRIzol (Invitrogen) and cDNA was synthesized with Superscript III enzyme (Invitrogen) according to the manufacturer. cDNA was incubated with either LAG-3, ADAM10, or ADAM17 primer/probe pair and an 18S primer/probe (Applied Biosystems) and run on an Applied Biosystems 7500 machine. To study LAG-3 and PD-1 expression on tolerized CD8 T cells, we performed adoptive transfer experiments using Clone 4 CD8 TCR transgenic T cells specific for an immunodominant peptide derived from HA (15). Transfer of Clone 4 CD8 T cells into mice bearing HA as either self-Ag or tumor Ag renders them tolerant (7, 16, 17, 18). Several definitions of CD8 T cell tolerance have been described, including a failure of tolerized CD8 T cells to proliferate upon Ag encounter (19). In our model systems, we define CD8 T cell tolerance as defective CTL function with poor production of effector cytokines, such as IFN-γ. We recently showed that Ab blockade of either LAG-3 (7) or PD-1 (13) pathways can lead to an accumulation of functionally competent CD8 T cells within tolerized environments. However, it is unclear whether expression of these immune checkpoints mark separate populations of CD8 T cells. To determine the expression patterns of LAG-3 and PD-1 on tolerized CD8 T cells, naive WT or LAG-3 knockout Clone 4 CD8 T cells were adoptively transferred into mice expressing high levels of HA as a self-Ag (C3-HAhigh) and lymph nodes were harvested after 3 days. Surprisingly, Clone 4 CD8 T cells displayed three distinct phenotypes, LAG-3+PD-1int; LAG-3negPD-1int; and PD-1high, 3 days after transfer into C3-HAhigh mice (Fig. 1⇓A). Also shown in Fig. 1⇓A are isotype staining for PD-1, as well as LAG-3 knockout Clone 4 CD8 cells used for LAG-3 and PD-1 gating controls. LAG-3 expression on the PD-1high population was somewhat variable but never bimodal. However, the functional state of LAG-3+PD-1high and LAG-3negPD-1high are similar (see Fig. 3⇓B) and therefore this population will be referred to as simply PD-1high. Consistently, we observed that the majority (>75%) of Clone 4 CD8 T cells transferred in C3-HAhigh mice stained positive for PD-1 3 days after transfer, with between 20 and 50% of Clone 4 CD8 displaying the LAG-3+PD-1int phenotype. LAG-3 and PD-1 subsets have distinct phenotype and cytokine secretion patterns. A, Axial LN were harvested 3 days after transfer of Clone 4 CD8 T cells and single cell suspensions were stimulated in vitro with HA peptide and brefeldin A for 4 h. Cells were gated on Thy1.1+ cells to differentiate endogenous from transferred cells. Also shown are LAG-3 knockout Clone 4 CD8 cells as a gating control for LAG-3 as well as WT Clone 4 CD8 stained with LAG-3 and a PD-1 isotype Ab. B, IFN-γ and TNF-α analysis of LAG-3+PD-1int, LAG-3negPD-1int, and PD-1high CD8+Thy1.1+ populations after transfer into C3-HAhigh mice followed by in vitro stimulation. IFN-γ (C), TNF-α (D), ICOS (E), and 4-1BB (F) expression by CD8 subpopulations from C3-HAhigh axial lymph nodes. Shown are representative plots from one of four experiments each, involving three mice per group. We next determined whether these separate populations of CD8 T cells had distinct phenotypes. Three days after transfer of Clone 4 CD8 T cells into C3-HAhigh mice, lymph node-derived cells were stimulated in vitro for 4 h ± HA peptide and stained for IFN-γ and TNF-α. Following peptide stimulation, IFN-γ production varied considerably between these three subsets. There was approximately double the number of LAG-3+PD-1intIFN-γ+ CD8 T cells compared with LAG-3negPD-1intIFN-γ+ cells, while IFN-γ was lowest within the PD-1high subset (Fig. 1⇑, B and C). These data are similar to those reported in a model of chronic LCMV infection, where exhausted CD8 T cells display high levels of PD-1 and low IFN-γ production (9). In this study, we demonstrate that under tolerizing conditions, LAG-3+PD-1int cells are the major IFN-γ producers. TNF-α production from Clone 4 CD8 T cells followed a similar pattern to that of IFN-γ production. LAG-3+PD-1int cells produced significantly higher TNF-α than LAG-3negPD-1int cells (Fig. 1⇑, B and D). However, whereas PD-1high cells produced very little IFN-γ, their TNF-α levels were similar to that of LAG-3+PD-1int cells. TNF-α and IFN-γ production have been observed in chronically stimulated CD8 T cells but the levels of each are drastically reduced relative to activated CD8 T cells (9). Similarly, Clone 4 CD8 T cells transferred into C3-HAhigh mice produce reduced levels of both IFN-γ and TNF-α compared with Clone 4 CD8 T cells transferred into recombinant Vaccinia virus expressing WT HA protein infected naive mice (Fig. 1⇑B, bottom row). Interestingly, the pattern of IFN-γ secretion from acutely activated Clone 4 CD8 T cells is similar to that of cells activated in a tolerizing setting, with LAG+PD-1int cells producing the most cytokine. Many costimulatory proteins expressed on the surface of lymphocytes are important for CD8 proliferation and effector function, including ICOS and 41-BB (20, 21). We next assessed expression profile of each subset with regards to either ICOS (Fig. 1⇑E) or 4–1BB (Fig. 1⇑F). No differences in ICOS or 4–1BB expression was observed among the three subsets. Overall, these results indicate that under tolerizing conditions, Ag-specific CD8 T cells display several distinct patterns of LAG-3 and PD-1 expression, and that these expression patterns correlate with cytokine production. Because, Clone 4 CD8 T cells expressing a LAG-3+PD-1int phenotype have greater production of IFN-γ and TNF-α than LAG-3negPD-1int cells (Fig. 1⇑), we examined whether cytolytic function differs between the subsets of CD8 T cells. To assess cytolytic function, Thy1.1+ Clone 4 CD8 T cells were adoptively transferred into Thy1.2+ C3-HAhigh mice. Because intracellular staining is required for LAG-3 detection in our model, complete separation of the three populations by flow sorting is not technically possible at this time. We therefore compared the cytolytic function of Clone 4 CD8 PD-1int (which include LAG-3+ and LAG-3neg cells) vs Clone 4 CD8 PD-1high subsets. Three days after transfer of Clone 4 CD8 T cells into C3-HAhigh mice, lymphocytes were sorted into PD-1int and PD-1high groups and an in vitro CTL assay was performed. As shown in Fig. 2⇓A, the CTL function of Clone 4 CD8 PD-1int T cells was significantly higher than PD-1high cells although, as expected, lower than cells activated in a nontolerizing environment (Fig. 2⇓B). To further address the cytolytic potential of the CD8 T cell subsets, CD107 staining was performed on Clone 4 CD8 cells transferred into CD-3HAhigh mice. After 3 days in vivo, LAG-3negPD-1int cells had greater surface expression than PD-1high cells, supporting the in vitro CTL data (Fig. 2⇓C). Interestingly, LAG-3+PD-1int cells showed greater CD107 expression than LAG-3negPD-1int, as was seen with the IFN-γ and TNF-α staining, suggesting that the LAG-3+PD-1int CD8 T cells are functionally superior to the other subsets. These results suggest that CTL function, in addition to the IFN-γ secretion, is severely impaired in CD8 T cells that have highly expressed PD-1 on the surface. CD8 subsets differ in cytolytic ability. A, Thy1.1+Clone 4 CD8 T cells were transferred into Thy1.2+C3-HAhigh mice. After 3 days cells were sorted into CD8+Thy1.1+PD-1int or CD8+Thy1.1+PD-1high subsets and cultured in vitro for 3 days as described. B, Naive Clone 4 CD8 cells activated in vitro with anti-CD3 served as positive control killing. In vitro CTL function was assessed using HA-peptide pulsed target cells labeled with 51Cr. (∗∗, p = 0.002; ∗, p = 0.04). Results shown are from one of three experiments. C, Expression of CD107 was determined on Clone 4 CD8 T cells transferred into C3-HAhigh mice after 3 days as described in Fig. 1. Because LAG-3 and PD-1 define subsets of CD8 T cells activated under tolerizing conditions, we sought to define the kinetics of LAG-3 and PD-1 expression. Clone 4 CD8 T cells were adoptively transferred into C3-HAhigh mice and were harvested at various time points. One day after transfer, we failed to detect a significant number of Clone 4 CD8 T cells (data not shown). Two days after transfer, Clone 4 CD8 T cells were readily detectable, and CD8 T cells appeared to be transitioning toward activation, as approximately half remained both LAG-3 and PD-1 negative, indicative of a naive phenotype. Even at this early time point, Clone 4 CD8 T cells displayed a similar LAG-3 and PD-1 phenotype to that seen on days three and four after transfer (Fig. 3⇓A). 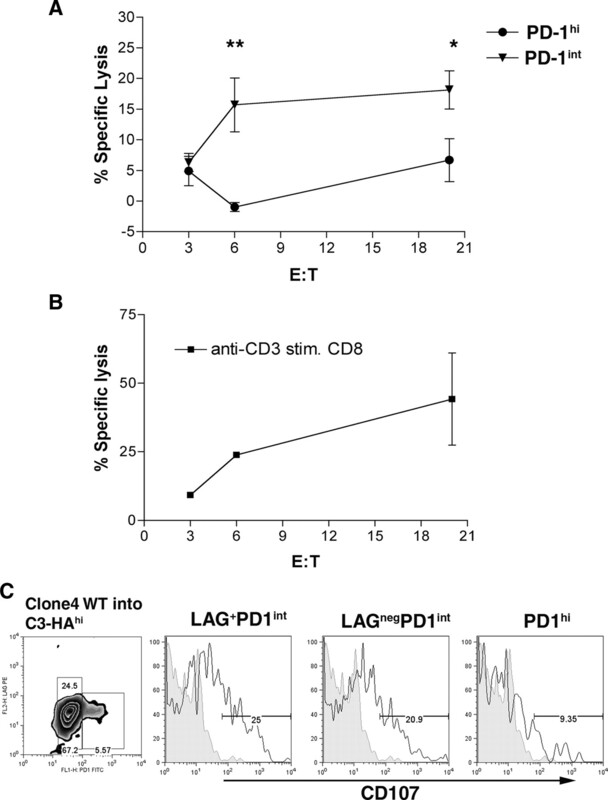 These results suggest that upon Ag encounter within a tolerizing environment, CD8 T cells differentiate into the three described LAG-3 and PD-1 phenotypes in parallel rather than in series. As noted earlier, the PD-1high population contains both LAG-3neg and LAG-3+ cells (Figs. 1⇑ and 3⇓B). Interestingly, both LAG-3+PD-1high and LAG-3negPD-1high CD8 T cells are deficient in IFN-γ production (Fig. 3⇓B) further suggesting, along with the CTL data (Fig. 2⇑), that once CD8 T cells have entered into a PD-1high phenotype, they are nonresponsive. The time-course data also reveals that PD-1high cells tend to express LAG-3 as the time of chronic Ag exposure lengthens (Fig. 3⇓, A and C). CD8 subset differentiation occurs immediately after Ag exposure in vivo. A, Purified Clone 4 CD8+ cells (2 × 106) were transferred into C3-HAhigh mice, and at the indicated times mice were sacrificed and axial LN were harvested for analysis. Single cell suspensions were stained for Thy1.1, LAG-3, and PD-1. B, After 4 days in C3-HAhigh mice, Clone 4 CD8 T cells were harvested and stimulated in vitro with HA peptide followed by Thy1.1, PD-1, LAG-3 and IFN-γ Ab staining. C, Ratio of LAG-3+PD-1int : LAG-3negPD-1int and LAG-3+PD-1high : LAG-3negPD-1high CD8 T cells as a function of time. D, Purified CFSE-labeled Thy1.1+ Clone 4 CD8 T cells were transferred into C3-HAhigh or C3-HAlow mice. After 2 days, axial LN were harvested and single cell suspensions were stained for Thy1.1, PD-1, LAG-3, and CFSE expression. Shown are the Thy1.1+ CFSE histograms. E, LAG-3 and PD-1 expression on Thy1.1+ T cells after adoptive transfer as a function of cell division. Each figure is representative of at least two independent experiments with similar results. To further dissect the expression pattern of LAG-3 and PD-1 as it correlates to cell division, Clone 4 CD8 T cells were CFSE labeled before transfer into C3-HAhigh mice. The role of Ag level was also assessed using C3-HAlow mice, which express HA in a similar tissue distribution (predominantly lung) but have ∼100-fold less HA expression compared with C3-HAhigh mice (22). Two days after transfer, Clone 4 CD8 T cells had a broad range of divided cells (Fig. 3⇑D), whereas at 3 days, most CD8 T cells had divided greater than five rounds (data not shown). We therefore chose the 2-day time point to assess PD-1 and LAG-3 expression. Clone 4 CD8 T cells transferred into either C3-HAhigh or C3-HAlow mice had undergone between 0 and 7 rounds of division after 2 days. Clone 4 CD8 T cells as a function of cell division were thus assessed for expression of LAG-3+PD-1int or LAG-3negPD-1int phenotypes. As shown in Fig. 3⇑E, both C3-HAhigh and C3-HAlow models had similar expression patterns of LAG-3 and PD-1, with slightly higher PD-1 expression on cells transferred to C3-HAlow mice, as previously described (13). In both C3-HAhigh and C3-HAlow mice LAG-3 expression can be detected as early as the first division. LAG-3 expression peaked between division 3 and 4 and was diminished to an undetectable level after repeated rounds of division. PD-1 protein expression was also detectable at the first division, and in contrast to LAG-3, peaked by division 5 and was still readily present in fully divided cells (Fig. 3⇑E). Overall, these results suggest that when CD8 T cells recognize Ag in a tolerizing environment, both LAG-3 and PD-1 are immediately expressed, i.e., that coexpression may occur in a parallel, rather than a serial, fashion. We next sought to address the possible mechanism(s) behind sustained LAG-3 expression during chronic Ag stimulation. C3-HAhigh mice express high levels of HA and are a potent tolerizing environment for lymphocytes. Thus, we tested whether varying Ag levels in a nontolerizing environment could induce LAG-3 and PD-1 expression. Clone 4 CD8 T cells were adoptively transferred into naive B10.d2 mice followed by vaccination with an emulsion of IFA and a varying concentration of HA peptide. As shown in Fig. 4⇓, Clone 4 CD8 T cells transferred into C3-HAhigh mice displayed the LAG-3 and PD-1 phenotypes described previously. Seven days after transfer, Clone 4 cells from draining lymph nodes of IFA-only treated mice had <1% LAG-3+PD-1int cells and ∼20% of CD8 T cells were LAG-3negPD-1int (Fig. 4⇓, row 3). However, increasing the HA peptide dose significantly increased the percentage of LAG-3+PD-1int CD8 T cells, as well as LAG-3negPD-1int cells (Fig. 4⇓, rows 4 and 5). IFN-γ levels also correlated with LAG-3 and PD-1 phenotypes, as LAG-3+PD-1int cells consistently demonstrated increased IFN-γ production compared with LAG-3negPD-1int CD8 T cells. Interestingly, this pattern was similar to that observed in C3-HAhigh mice. In vitro activation of splenocytes for 3 days using anti-CD3 resulted in >80% of CD8 T cells coexpressing both LAG-3 and PD-1, further suggesting that a strong, sustained TCR stimulation contributes to the enhanced LAG-3 and PD-1 expression on CD8 T cells (data not shown). These results suggest that Ag concentration plays a major role in the differentiation of CD8 T cell subsets in vivo with higher levels of PD-1 and LAG-3 expression correlating with increasing Ag concentration. Ag concentration determines expression level of PD-1 and LAG-3 on HA-specific CD8 T cells. Thy1.2+C3-HAhigh and B10.d2 mice were adoptively transferred with 106 WT or LAG-3 knockout Thy1.1+ Clone 4 CD8 T cells and immediately vaccinated with an emulsion of IFA and varying concentrations of HA peptide (0, 5, 10, and 50 μg). Seven days after vaccination, vaccine-draining or contra-lateral lymph nodes were harvested, homogenized, and stained for Thy1.1, LAG-3, PD-1, and IFN-γ. Helper CD4 T cells affect a wide range of immune system processes, including CD8 T cell effector function and memory cell formation (23, 24), while regulatory CD4 T cells may suppress CTL activity and maintain tolerance (25). We thus examined whether endogenous CD4 T cells could affect LAG-3 and PD-1 expression on adoptively transferred Clone 4 CD8 T cells. We depleted C3-HAhigh mice of endogenous CD4 cells using GK1.5 treatment, which resulted in >98% CD4+ cell depletion (Fig. 5⇓). Adoptive transfer of Clone 4 CD8 T cells into CD4+ depleted C3-HAhigh mice did not alter the differentiation of Clone 4 CD8 T cells into LAG-3 and PD-1 subsets (Fig. 5⇓). However, depletion of CD4 cells resulted in a profound effect on the ability of Clone 4 CD8 T cells to produce IFN-γ, with an approximate 3-fold increase in cytokine production after restimulation. Interestingly, while the IFN-γ levels were enhanced after removal of CD4 T cells, the relative pattern of IFN-γ expression by the three LAG-3/PD-1 CD8 T cell subsets remained consistent, with LAG-3+PD-1int cells the highest producers, and the PD-1high subset the lowest. These data suggest that CD4 T cells do not appear to influence the relative expression of PD-1 and LAG-3 on the surface of CD8 T cells in this setting of self-Ag recognition. 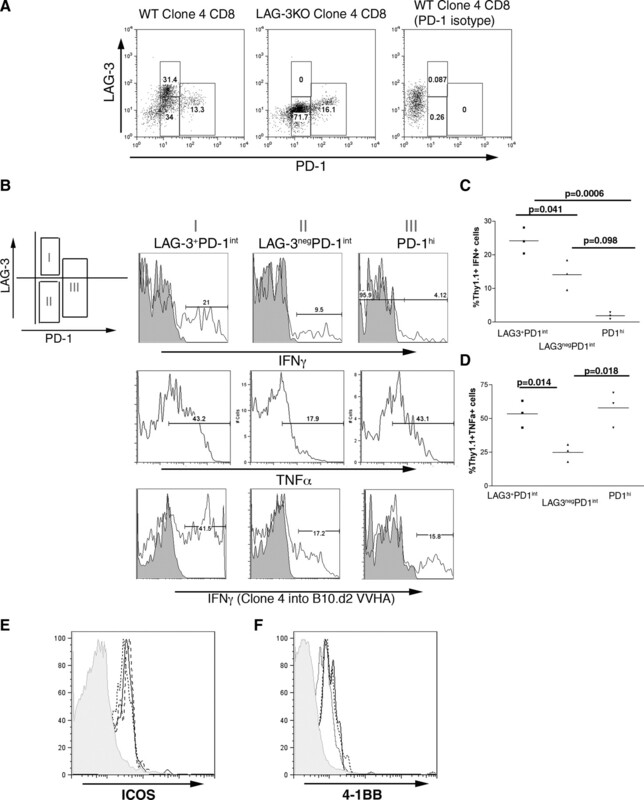 CD4 lymphocytes do not alter the expression of LAG-3 and PD-1 on CD8 cells. Thy1.1+Clone 4 CD8 cells (106) were transferred into C3-HAhigh (A) or GK1.5-treated C3-HAhigh (B) mice. Three days after transfer, Clone 4 CD8 cells were assessed for the expression of LAG-3, PD-1, and IFN-γ by flow cytometry. In vivo activation of Clone 4 CD8 T cells during acute infection results in the transient expression of both LAG-3 and PD-1, while chronic Ag stimulation leads to prolonged, stable expression of negative regulatory proteins (26). Although Ag concentration clearly contributes to LAG-3 and PD-1 expression on Clone 4 CD8 T cells (Fig. 4⇑), we sought to further dissect the mechanism behind the maintenance of negative costimulatory expression on tolerized CD8 T cells. During acute infection, the host immune system responds to both Ag and pathogen-associated molecular patterns, such as LPS, which trigger proinflammatory cytokine production by signaling through TLR. However, CD8 T cells activated within an environment of self-Ag do not receive TLR signals, resulting in the absence of proinflammatory cytokines. We hypothesized that providing TLR signaling during T cell expansion in a self-Ag (tolerizing) environment could lead to a reduction of LAG-3 levels during CD8 T cell activation. Thus, after adoptive transfer of Clone 4 CD8 T cells, C3-HAhigh were treated with daily injections of LPS or poly(IC) to assess the role of TLR agonism on LAG-3 expression. As shown in Fig. 6⇓A, Clone 4 CD8 T cells displayed a dramatic reduction of LAG-3 expression after treatment with either LPS or poly(IC) treatment 5 days after adoptive transfer into C3-HAhigh mice. In addition to a decrease in LAG-3 expression, Clone 4 CD8 T cells down-regulated CD62L after TLR treatment, indicative of an activated phenotype. The percentage of Clone 4 CD8 T cells was also increased 4- to 5-fold after addition of TLR agonists, similar to what is observed using LAG-3 knockout CD8 T cells (Fig. 6⇓A). Analogous effects on PD-1 levels were not observed in this system (data not shown). Signaling through TLR3 (polyI:C) triggers inflammatory cytokine production in a MyD88-independent fashion, while TLR4 (LPS) is MyD88-dependent (27, 28). Both receptors activate NF-κB through TRIF, suggesting a possible role for this pathway in LAG-3 down-regulation. Overall, these data suggest that TLR stimulation within a tolerizing environment results in an altered expression of the negative regulator protein, LAG-3, on CD8 T cells. 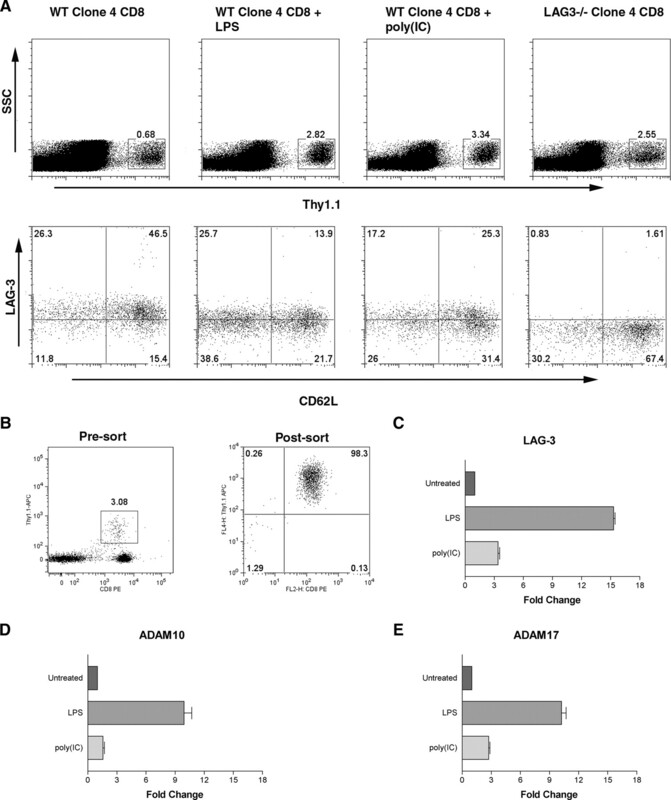 TLR signaling reduces CD8 T cell expression of LAG-3 and enhances cell number and function. A, Thy1.2+C3-HAhigh mice were injected with LPS, poly(IC) i.p., or left untreated after adoptive transfer with 106 Thy1.1+ Clone 4 CD8. Mice received daily injections of either LPS or poly(IC). Five days after transfer, axial lymph nodes were harvested and assessed for Clone 4 CD8 expression of LAG-3 and CD62L. Top panels, Percent of Clone 4 CD8 cells in lymph nodes while bottom panels show the expression of LAG-3 and CD62L on Thy1.1+ cells. B, WT or LAG-3−/− Clone 4 CD8 cells were transferred into untreated, LPS, or poly(IC) injected C3-HAhigh mice. Five days after transfer, Thy1.1+CD8+ lymphocytes were sorted from spleen and lymph nodes and total RNA was prepared. The sorted populations were >98% pure. Real-time quantitative PCR for LAG-3 (C), ADAM10 (D), and ADAM17 (E). All samples are normalized to WT Clone 4 CD8 transferred into C3-HAhigh without TLR agonist treatment. LAG-3 expression is enhanced by proinflammatory cytokines such as IL-12, IL-7, and IL-2 (29), but the molecule is also cleaved at the cell surface by ADAM10 and ADAM17/TACE (30). 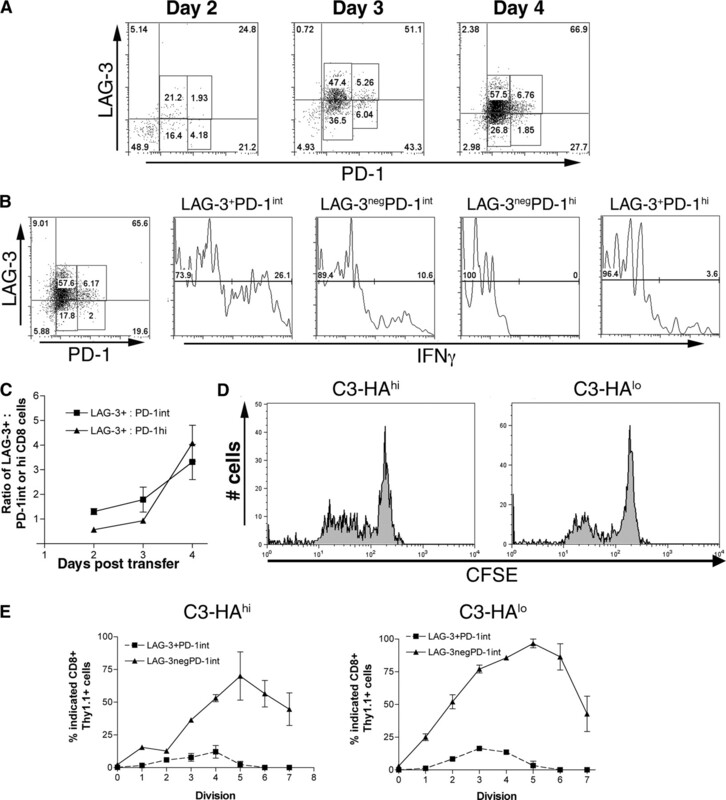 Cleavage of LAG-3 is critical for normal lymphocyte proliferation and cytokine secretion. Thus, the reduced LAG-3 levels observed in mice treated with TLR agonists could represent either reduced transcription or potentially reflect increased expression of the ADAM proteins. To examine these alternative mechanisms, we examined LAG-3 message levels in Clone 4 CD8 T cells adoptively transferred into C3-HAhigh mice treated with TLR agonists. CD8+Thy1.1+ sorted T cells from TLR-treated mice displayed higher levels of LAG-3 message relative to untreated mice (Fig. 6⇑B). In addition to increased LAG-3 message, Clone 4 CD8 T cells from LPS or poly(IC) treated mice expressed higher amounts of both ADAM10 and ADAM17 message (Fig. 6⇑, C and D) suggesting that the lower cell surface expression of LAG-3 most likely results from increased activity of the ADAM proteases, rather than from decreased LAG-3 transcription. Activation of Ag-specific CD8 T cells in environments containing either tumor, self-Ag, or chronic infection result in T cells with poor effector function (31, 32). A variety of extrinsic factors effects the overall CD8 T cell response, including Ag concentration and availability, the type of APCs present, and regulatory T cell subsets. However, we are just beginning to understand the role of intrinsic cell surface regulatory proteins on the function and maintenance of CD8 T cells during activating and tolerizing conditions. Two such proteins, LAG-3 and PD-1, are highly expressed on CD8 T cells that divide under tolerizing conditions. Both LAG-3 and PD-1 function as negative regulator proteins, and inhibition of these proteins using Ab blockade leads to a substantial increase in Ag-specific CD8 expansion and function in vivo (7, 9, 10, 33, 34). However, these studies did not address whether individual CD8 T cells were expressing both LAG-3 and PD-1 or if multiple phenotypes of CD8 T cells existed after activation under tolerizing conditions. In this study, we demonstrate that Ag-specific CD8 T cells can differentiate into three populations based on LAG-3 and PD-1 expression, with each group having a distinct function and phenotype. The process of memory cell differentiation is also characterized by expression-specific cell surface molecules (35, 36). Several groups have demonstrated that the intrinsic variability of memory CD8 subsets contributes to significant differences of both in vivo function and persistence (37, 38, 39, 40). In this study, we show that during activation under tolerizing conditions, Ag-specific CD8 T cells similarly differentiate into functionally distinct subgroups. 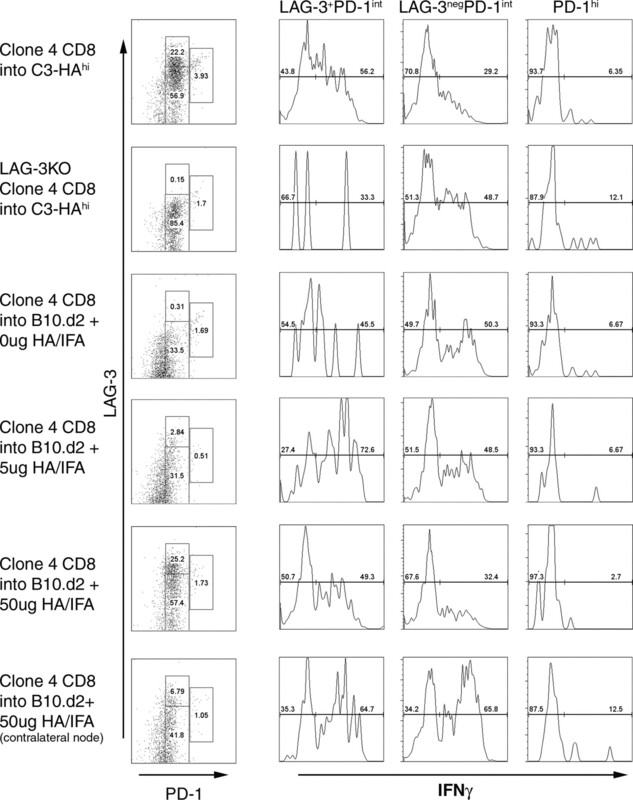 Using an in vivo model of self-tolerance where HA is the self-Ag, HA-specific CD8 T cells can differentiate into either LAG-3+PD-1int, LAG-3negPD-1int, and PD-1high subsets. The subsets not only show distinct phenotypes, but have functionally distinct properties as well. We and others have previously shown that CD8 T cells expressing high levels of PD-1 are functionally inert (9, 13, 41, 42). During LCMV infection, TNF-α production in Ag-specific CD8 T cells is lost during the early stages of exhaustion, while IFN-γ production is maintained until the late stages of exhaustion (43, 44). In our model, CD8 T cells expressing the highest levels of PD-1 (PD-1high) are not capable of producing IFN-γ mediating lytic function. In contrast, cells expressing an intermediate level of PD-1 can produce IFN-γ and TNF-α upon restimulation in vitro. Among the PD-1int CD8 T cells, the greatest IFN-γ and TNF-α producers are the cells that coexpress LAG-3. These results suggest that, under tolerizing conditions, the three subsets of CD8 T cells have distinct functional characteristics, with LAG-3 expressing cells being the most responsive. Although vaccinia virus induces a robust vaccine response in mice, virus is cleared after 3 days (45) and Ag persistence is relatively limited compared with C3-HA mice expressing HA as a self-Ag. We used peptide/IFA emulsions to determine whether Ag persistence may play a role in LAG-3 and PD-1 expression. Our results show that at high peptide concentrations, Clone 4 CD8 T cells differentiate into the same LAG-3 and PD-1 subsets found after transfer into C3-HAhigh mice. Furthermore, IFN-γ production in LAG-3/PD-1 subsets was similar in subsets activated in HA/IFA injected mice or in C3-HAhigh mice, suggesting that the differentiation state is not specific to the tolerogenic state per se, but rather at least partially dependent on Ag concentration/persistence. Because the subsets of CD8 T cells had significant phenotypic and cytokine secretion differences, we undertook experiments to determine whether they had distinct cytolytic capabilities. CD8+PD-1int and CD8+PD-1high cells sorted from C3-HAhigh mice were tested for their cytolytic function in an in vitro CTL assay. Results from these experiments concluded that CD8 T cells bearing an intermediate level of PD-1 protein were more potent at target cell lysis than high PD-1 expressing cells. These results are consistent with cytokine secretion data and suggest that a CD8 T cell expressing high levels of PD-1 are functionally inert. Similar observations were noted during chronic LCMV stimulation, where PD-1high Ag-specific CD8 T cells are unable to be rescued by anti-PD-1 treatment (46). The various LAG-3 and PD-1 CD8 T cell subsets appear to arise at, or very soon after Ag encounter. The CD8 T cell subsets accumulate over time without significant changes in the ratio of one subset to another (Day 2 LAG-3+PD-1int : LAG-3negPD-3int = 1.3 and Day 4 LAG-3+PD-1int : LAG-3negPD-3int = 2.1) (Fig. 3⇑A). Therefore, we speculate that the each subset is expanding over time. The maintenance of the LAG-3+PD-1int population is interesting, as we show that very few LAG-3+PD-1 cells were capable of more than five rounds of division (Fig. 3⇑E). Functionally, LAG-3 negatively regulates T cell proliferation and homeostasis, thus this discrepancy may be due to LAG-3 arresting cellular division allowing the accumulation of the LAG-3+ CD8 population. Studies are underway to delineate the molecular mechanism by which LAG-3 affects proliferation. Under low Ag conditions (5 μg HA/IFA), the majority of transferred CD8 T cells are LAG-3 and PD-1 negative, and appear naive. However, the remaining CD8 T cells are LAG-3negPD-1int CD8 T cells, with very small populations of LAG-3+PD-1int and PD-1high subsets (Fig. 4⇑). 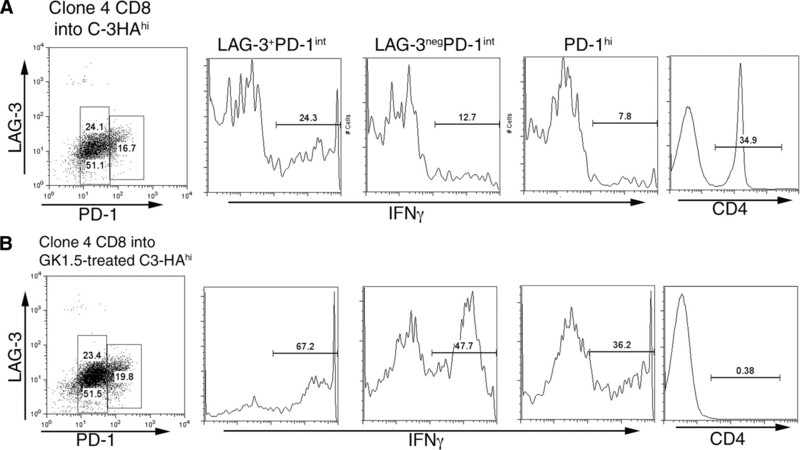 Interestingly, the LAG-3negPD-1int CD8 T cells have a substantially lower PD-1 mean fluorescent intensity and produce more IFN-γ than LAG-3negPD-1int cells stimulated using 50 μg HA/IFA. These results further suggest that as PD-1 levels increase, effector function of CD8 T cells decreases, as seen when comparing PD-1int to PD-1high CD8 T cells in this study and others. Interestingly, the presence of LAG-3 on the PD-1int cells correlates with the ability of these cells to produce IFN-γ, TNF-α, and CD107. LAG-3 is a negative regulator of T cell function, so it comes as a surprise that the double positive cells are actually more functional effector T cells than LAG-3negPD-1int CD8 T cells. It should be noted that CD8 T cells activated in an acute, nontolerizing scenario express both LAG-3 and PD-1 and are fully capable of producing effector cytokine. Therefore the presence of negative regulatory receptors does not preclude a T cell from being an effector cell, especially in the acute situation, although the continued presence of these receptors is overall detrimental to the response. With that said, it is still unclear as to why the double positive cells are more functional effector cells, although the molecular function of LAG-3 and its role in cytokine production and CD8 lytic ability is still unknown but currently being addressed. Signaling through TLR pathways is important for establishing long-lived, functional immunity toward pathogens. In our model of CD8 T cell tolerance, addition of TLR agonists resulted in enhanced CD8 T cell proliferation accompanied by a decrease in LAG-3 protein expression. Interestingly, LAG-3 message was increased in CD8 T cells after in vivo TLR stimulation, even as LAG-3 protein levels decreased. However, both ADAM10 and ADAM17, both known to cleave LAG-3 at the cell surface, were increased post TLR treatment. This finding implies that TLR stimulation results in a significant expansion of tolerized CD8 T cells through activation of ADAM-family metalloproteases, resulting in cleavage of the negative regulatory protein LAG-3. Blackburn et al. (47) recently demonstrated that in a model of chronic LCMV infection, Ag specific CD8 T cells coexpress several negative regulator proteins, including PD-1 and LAG-3. Dual blockade of LAG-3 and PD-1 resulted in significant increases in Ag specific CD8 T cell numbers and function, as well as marked reductions in viral titer compared with untreated and single blockade-treated mice. Our results are broadly consistent with these data, demonstrating distinct phenotypic and functional subsets of CD8 T cells after activation within tolerizing conditions. The discovery of these subsets, based on LAG-3 and PD-1 staining, may be useful in further understanding CD8 T cell tolerance, and may facilitate the design of immunotherapy regimens for cancer and chronic infection, wherein CD8 T cell exhaustion is prevalent. We thank L. Blosser and A. Tam for cell sorting and F. Housseau for technical help. C. G. Drake, D. M. Pardoll, and D. A. Vignali are inventors on a patent relevant to the subject of this manuscript and are thus potentially eligible to receive future royalties from licensing. ↵1 C.G.D. is a Damon Runyon-Lilly Clinical Investigator. This work was also supported by National Institutes of Health R01 CA127153 (CGD), K08 CA096948 (CGD), and the Patrick C. Walsh Fund. D.M.P. is a Januey Scholar, holds the Seraph Chair for Cancer Research, and is supported in part by gifts from William and Betty Toperer, Dorothy Needle, and the Commonwealth Foundation. D.A.A.V. is supported by National Institutes of Health (NIH) (AI-39480), a Cancer Center Support CORE Grant (CA-21765), and the American Lebanese Syrian Associated Charities (ALSAC). ↵3 Abbreviations used in this paper: LAG-3, Lymphocyte Activation Gene-3; PD-1, Programmed Death 1; HA, hemagglutinin; IFA, incomplete Freund’s adjuvant; WT, wild type. Triebel, F., S. Jitsukawa, E. Baixeras, S. Roman-Roman, C. Genevee, E. Viegas-Pequignot, T. Hercend. 1990. LAG-3, a novel lymphocyte activation gene closely related to CD4. J. Exp. Med. 171: 1393-1405. Kisielow, M., J. Kisielow, G. Capoferri-Sollami, K. Karjalainen. 2005. Expression of lymphocyte activation gene 3 (LAG-3) on B cells is induced by T cells. Eur. J. Immunol. 35: 2081-2088. Huang, C. T., C. J. Workman, D. Flies, X. Pan, A. L. Marson, G. Zhou, E. L. Hipkiss, S. Ravi, J. Kowalski, H. I. Levitsky, et al 2004. Role of LAG-3 in regulatory T cells. Immunity 21: 503-513. Workman, C. J., L. S. Cauley, I. J. Kim, M. A. Blackman, D. L. Woodland, D. A. Vignali. 2004. Lymphocyte activation gene-3 (CD223) regulates the size of the expanding T cell population following antigen activation in vivo. J. Immunol. 172: 5450-5455. Workman, C. J., D. A. Vignali. 2003. The CD4-related molecule, LAG-3 (CD223), regulates the expansion of activated T cells. Eur. J. Immunol. 33: 970-979. Workman, C. J., D. S. Rice, K. J. Dugger, C. Kurschner, D. A. Vignali. 2002. Phenotypic analysis of the murine CD4-related glycoprotein, CD223 (LAG-3). Eur. J. Immunol. 32: 2255-2263. Grosso, J. F., C. Kellaher, T. J. Harris, C. H. Maris, E. L. Hipkiss, A. DeMarzo, R. Anders, G. Netto, D. Getnet, T. Bruno, et al 2007. LAG-3 regulates CD8 T cell accumulation and effector function during self and tumor tolerance. J. Clin. Invest. 117: 3383-3392. Freeman, G. J., A. J. Long, Y. Iwai, K. Bourque, T. Chernova, H. Nishimura, L. J. Fitz, N. Malenkovich, T. Okazaki, M. C. Byrne, et al 2000. Engagement of the PD-1 immunoinhibitory receptor by a novel B7 family member leads to negative regulation of lymphocyte activation. J. Exp. Med. 192: 1027-1034. Barber, D. L., E. J. Wherry, D. Masopust, B. Zhu, J. P. Allison, A. H. Sharpe, G. J. Freeman, R. Ahmed. 2006. Restoring function in exhausted CD8 T cells during chronic viral infection. Nature 439: 682-687. Day, C. L., D. E. Kaufmann, P. Kiepiela, J. A. Brown, E. S. Moodley, S. Reddy, E. W. Mackey, J. D. Miller, A. J. Leslie, C. DePierres, et al 2006. PD-1 expression on HIV-specific T cells is associated with T-cell exhaustion and disease progression. Nature 443: 350-354. Freeman, G. J., E. J. Wherry, R. Ahmed, A. H. Sharpe. 2006. Reinvigorating exhausted HIV-specific T cells via PD-1-PD-1 ligand blockade. J. Exp. Med. 203: 2223-2227. Drake, C. G., A. D. Doody, M. A. Mihalyo, C. T. Huang, E. Kelleher, S. Ravi, E. L. Hipkiss, D. B. Flies, E. P. Kennedy, M. Long, et al 2005. Androgen ablation mitigates tolerance to a prostate/prostate cancer-restricted antigen. Cancer Cell. 7: 239-249. Goldberg, M. V., C. H. Maris, E. L. Hipkiss, A. S. Flies, L. Zhen, R. M. Tuder, J. F. Grosso, T. J. Harris, D. Getnet, K. A. Whartenby, et al 2007. Role of PD-1 and its ligand, B7–H1, in early fate decisions of CD8 T cells. Blood 110: 186-192. Betts, M. R., J. M. Brenchley, D. A. Price, S. C. De Rosa, D. C. Douek, M. Roederer, R. A. Koup. 2003. Sensitive and viable identification of antigen-specific CD8+ T cells by a flow cytometric assay for degranulation. J. Immunol. Methods 281: 65-78. Morgan, D. J., R. Liblau, B. Scott, S. Fleck, H. O. McDevitt, N. Sarvetnick, D. Lo, L. A. Sherman. 1996. CD8+ T cell-mediated spontaneous diabetes in neonatal mice. J. Immunol. 157: 978-983. Hernandez, J., S. Aung, W. L. Redmond, L. A. Sherman. 2001. Phenotypic and functional analysis of CD8+ T cells undergoing peripheral deletion in response to cross-presentation of self-antigen. J. Exp. Med. 194: 707-717. Yang, Y., C. T. Huang, X. Huang, D. M. Pardoll. 2004. Persistent Toll-like receptor signals are required for reversal of regulatory T cell-mediated CD8 tolerance. Nat. Immunol. 5: 508-515. Martinez, X., H. T. Kreuwel, W. L. Redmond, R. Trenney, K. Hunter, H. Rosen, N. Sarvetnick, L. S. Wicker, L. A. Sherman. 2005. CD8+ T cell tolerance in nonobese diabetic mice is restored by insulin-dependent diabetes resistance alleles. J. Immunol. 175: 1677-1685. Teague, R. M., B. D. Sather, J. A. Sacks, M. Z. Huang, M. L. Dossett, J. Morimoto, X. Tan, S. E. Sutton, M. P. Cooke, C. Ohlen, P. D. Greenberg. 2006. Interleukin-15 rescues tolerant CD8+ T cells for use in adoptive immunotherapy of established tumors. Nat. Med. 12: 335-341. Nurieva, R., S. Thomas, T. Nguyen, N. Martin-Orozco, Y. Wang, M. K. Kaja, X. Z. Yu, C. Dong. 2006. T-cell tolerance or function is determined by combinatorial costimulatory signals. EMBO J. 25: 2623-2633. Adler, A. J., D. W. Marsh, G. S. Yochum, J. L. Guzzo, A. Nigam, W. G. Nelson, D. M. Pardoll. 1998. CD4+ T cell tolerance to parenchymal self-antigens requires presentation by bone marrow-derived antigen-presenting cells. J. Exp. Med. 187: 1555-1564. Sun, J. C., M. J. Bevan. 2003. Defective CD8 T cell memory following acute infection without CD4 T cell help. Science 300: 339-342. Janssen, E. M., N. M. Droin, E. E. Lemmens, M. J. Pinkoski, S. J. Bensinger, B. D. Ehst, T. S. Griffith, D. R. Green, S. P. Schoenberger. 2005. CD4+ T-cell help controls CD8+ T-cell memory via TRAIL-mediated activation-induced cell death. Nature 434: 88-93. Wherry, E. J., S. J. Ha, S. M. Kaech, W. N. Haining, S. Sarkar, V. Kalia, S. Subramaniam, J. N. Blattman, D. L. Barber, R. Ahmed. 2007. Molecular signature of CD8+ T cell exhaustion during chronic viral infection. Immunity 27: 670-684. Trinchieri, G., A. Sher. 2007. Cooperation of Toll-like receptor signals in innate immune defense. Nat. Rev. Immunol. 7: 179-190. Kawai, T., S. Akira. 2007. TLR signaling. Semin. Immunol. 19: 24-32. Bruniquel, D., N. Borie, S. Hannier, F. Triebel. 1998. Regulation of expression of the human lymphocyte activation gene-3 (LAG-3) molecule, a ligand for MHC class II. Immunogenetics 48: 116-124. Li, N., Y. Wang, K. Forbes, K. M. Vignali, B. S. Heale, P. Saftig, D. Hartmann, R. A. Black, J. J. Rossi, C. P. Blobel, et al 2007. Metalloproteases regulate T-cell proliferation and effector function via LAG-3. EMBO J. 26: 494-504. Shin, H., E. J. Wherry. 2007. CD8 T cell dysfunction during chronic viral infection. Curr. Opin. Immunol. 19: 408-415. Ha, S. J., S. N. Mueller, E. J. Wherry, D. L. Barber, R. D. Aubert, A. H. Sharpe, G. J. Freeman, R. Ahmed. 2008. Enhancing therapeutic vaccination by blocking PD-1-mediated inhibitory signals during chronic infection. J. Exp. Med. 205: 543-555. Jeong, H. Y., Y. J. Lee, S. K. Seo, S. W. Lee, S. J. Park, J. N. Lee, H. S. Sohn, S. Yao, L. Chen, I. Choi. 2008. Blocking of monocyte-associated B7–H1 (CD274) enhances HCV-specific T cell immunity in chronic hepatitis C infection. J. Leukocyte Biol. 83: 755-764. Sallusto, F., D. Lenig, R. Forster, M. Lipp, A. Lanzavecchia. 1999. Two subsets of memory T lymphocytes with distinct homing potentials and effector functions. Nature 401: 708-712. Hikono, H., J. E. Kohlmeier, S. Takamura, S. T. Wittmer, A. D. Roberts, D. L. Woodland. 2007. Activation phenotype, rather than central- or effector-memory phenotype, predicts the recall efficacy of memory CD8+ T cells. J. Exp. Med. 204: 1625-1636. Berger, C., M. C. Jensen, P. M. Lansdorp, M. Gough, C. Elliott, S. R. Riddell. 2008. Adoptive transfer of effector CD8+ T cells derived from central memory cells establishes persistent T cell memory in primates. J. Clin. Invest. 118: 294-305. Wherry, E. J., V. Teichgraber, T. C. Becker, D. Masopust, S. M. Kaech, R. Antia, U. H. von Andrian, R. Ahmed. 2003. Lineage relationship and protective immunity of memory CD8 T cell subsets. Nat. Immunol. 4: 225-234. Bachmann, M. F., P. Wolint, K. Schwarz, P. Jager, A. Oxenius. 2005. Functional properties and lineage relationship of CD8+ T cell subsets identified by expression of IL-7 receptor α and CD62L. J. Immunol. 175: 4686-4696. Roberts, A. D., K. H. Ely, D. L. Woodland. 2005. Differential contributions of central and effector memory T cells to recall responses. J. Exp. Med. 202: 123-133. Probst, H. C., K. McCoy, T. Okazaki, T. Honjo, M. van den Broek. 2005. Resting dendritic cells induce peripheral CD8+ T cell tolerance through PD-1 and CTLA-4. Nat. Immunol. 6: 280-286. Wherry, E. J., J. N. Blattman, K. Murali-Krishna, R. van der Most, R. Ahmed. 2003. Viral persistence alters CD8 T-cell immunodominance and tissue distribution and results in distinct stages of functional impairment. J. Virol. 77: 4911-4927. Fuller, M. J., A. Khanolkar, A. E. Tebo, A. J. Zajac. 2004. Maintenance, loss, and resurgence of T cell responses during acute, protracted, and chronic viral infections. J. Immunol. 172: 4204-4214. Hugin, A. W., C. Flexner, B. Moss. 1993. Clearance of recombinant vaccinia virus expressing IL-2: role of local host immune responses. Cell Immunol. 152: 499-509. Blackburn, S. D., H. Shin, G. J. Freeman, E. J. Wherry. 2008. Selective expansion of a subset of exhausted CD8 T cells by αPD-L1 blockade. Proc. Natl. Acad. Sci. USA 105: 15016-15021. Blackburn, S. D., H. Shin, W. N. Haining, T. Zou, C. J. Workman, A. Polley, M. R. Betts, G. J. Freeman, D. A. Vignali, E. J. Wherry. 2008. Coregulation of CD8+ T cell exhaustion by multiple inhibitory receptors during chronic viral infection. Nat. Immunol. 10: 29-37.